Everything you need! Our biggest and best package! Offer for new residential Suddenlink customers who are current or recent customers of satellite or other multichannel television services only. Former Suddenlink accounts previously not in good standing or who have disconnected service within the past 30 days are not eligible. Former Suddenlink accounts previously not in good standing or, who have disconnected service within the past 30 days are not eligible. May not be combined with other offers. Offer limited to the advertised level of service. To receive promo rate, must maintain all services at required level for the promo period. As of the 13th month, services will be billed at reg rate. For Contract Buy Out: Must provide copy of bill from competing provider, in same name and at same address, showing early termination fee amount and that you were an active customer with the competitor at time of sale without a past due balance. Bill may be submitted by email to [email protected] or by mail to Altice USA, Attn: DBB Program, 5110 80th St., Lubbock, TX 79424. Once all documents are received, you will receive a credit after 60 days of service. Reimbursement will be up to max of $500 if all services are maintained and account is in good standing. 30 day money-back only applies to the monthly service fee. EQUIP, TAXES & FEES: Installation fee applies. Taxes, fees and surcharges on each service based upon fair value allocation of bundle price. Cable box and modem will be included for 24 mos. and as of the 25th mo. will be billed at reg. rates. Suddenlink will also assess a Sports TV charge of $5.15 and a Broadcast TV surcharge of $10. All fees, equipment charges, surcharges and taxes will be added to bill and are subject to change during and after promotion period. SUDDENLINK TV: HDTV and HD set-top box required for HD service. Not all VOD is free. SUDDENLINK INTERNET: Minimum system requirements & equipment configurations apply. Speed Claims: Advertised speed for wired connection. Many factors affect speed. Actual speeds may vary and are not guaranteed. Wireless speed, performance and availability subject to factors beyond Suddenlink’s control. Other terms and conditions apply. All rights reserved. All the speed and crystal clear calling you need! Offer for new Suddenlink customers. Former Suddenlink accounts previously not in good standing or, who have disconnected service within the past 30 days are not eligible. May not be combined with other offers. Offer limited to the advertised level of service. To receive promo rate, must maintain all services at required level for the promo period. As of the 13th month service will be billed at regular rate. For Contract Buy Out: Must provide copy of bill from competing provider, in same name and at same address, showing early termination fee amount and that you were an active customer with the competitor at time of sale without a past due balance. Bill may be submitted by email to [email protected] or by mail to Altice USA, Attn: DBB Program, 5110 80th St., Lubbock, TX 79424. Once all documents are received, you will receive a credit after 60 days of service. Reimbursement will be up to max of $100 if all services are maintained and account is in good standing. 30 day money-back only applies to the monthly service fee. EQUIP, TAXES & FEES: Installation fee applies. Modem available for a $10 monthly charge. All fees, equipment charges, surcharges and taxes will be added to bill and are subject to change during and after promotion period. SUDDENLINK INTERNET: Minimum system requirements & equipment configurations apply. Speed Claims: Advertised speed for wired connection. Many factors affect speed. Actual speeds may vary and are not guaranteed. Wireless speed, performance and availability subject to factors beyond Suddenlink’s control. Other terms and conditions apply. All rights reserved. Your whole family will be entertained and connected. 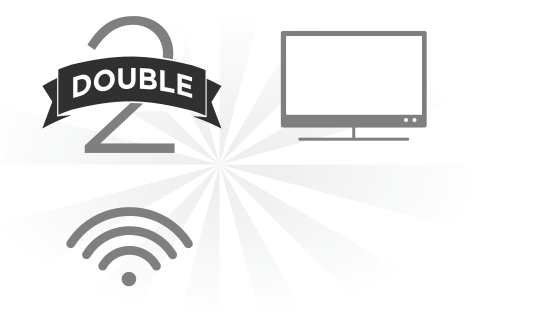 HD channels, unlimited data, and nearly 300 channels. Oh my! All the data you need; the speeds you want. And more! Offer for new residential Suddenlink customers who are current or recent customers of satellite or other multichannel television services only. Former Suddenlink accounts previously not in good standing or who have disconnected service within the past 30 days are not eligible. Former Suddenlink accounts previously not in good standing or, who have disconnected service within the past 30 days are not eligible. May not be combined with other offers. Offer limited to the advertised level of service. To receive promo rate, must maintain all services at required level for the promo period. As of the 13th month, services will be billed at reg rate. For Contract Buy Out: Must provide copy of bill from competing provider, in same name and at same address, showing early termination fee amount and that you were an active customer with the competitor at time of sale without a past due balance. Bill may be submitted by email to [email protected] or by mail to Altice USA, Attn: DBB Program, 5110 80th St., Lubbock, TX 79424. Once all documents are received, you will receive a credit after 60 days of service. Reimbursement will be up to max of $500 if all services are maintained and account is in good standing. 30 day money-back only applies to the monthly service fee. EQUIP, TAXES & FEES: Installation fee applies. Taxes, fees and surcharges on each service based upon fair value allocation of bundle price. Cable box and modem will be included for 24 mos. and as of the 25th mo. will be billed at reg. rates. Suddenlink will also assess a Sports TV charge of $5.15 and a Broadcast TV surcharge of $10. All fees, equipment charges, surcharges and taxes will be added to bill and are subject to change during and after promotion period. SUDDENLINK TV: HDTV and HD set-top box required for HD service. Not all VOD is free. SUDDENLINK INTERNET: Minimum system requirements & equipment configurations apply. Speed Claims: Advertised speed for wired connection. Many factors affect speed. Actual speeds may vary and are not guaranteed. Wireless speed, performance and availability subject to factors beyond Suddenlink’s control. 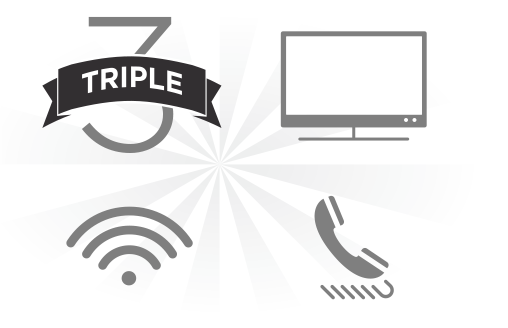 Enjoy all the channels your whole family loves with more Internet speed than you'll need! Everything you need; nothing you don't!